With the Digital HD release of Rogue One: A Star Wars Story coming on March 24, new details have started to surface about the production from director Gareth Edwards, as he makes the press rounds for the home video release. Yesterday, the filmmaker shed some light on why there aren't any deleted scenes on the Digital HD, Blu-ray and DVD release, and today the filmmaker reveals that one of the most talked-about scenes in the entire movie was not originally part of the script, and was shot just three or four months before Rogue One: A Star Wars Story hit theaters. The scene in question is the now-legendary Darth Vader lightsaber battle scene. During Gareth Edwards' new interview with Fandango, the filmmaker reveals that in the original script, Darth Vader never actually boards the ship. 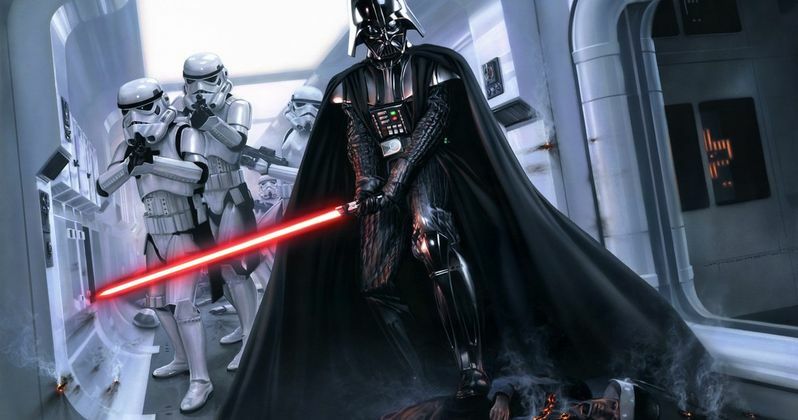 During the editing process, editor Jabbez Olsen came up with the idea that Darth Vader should actually get on that ship, but with just a few months until the release, Gareth Edwards didn't think LucasFilm would approve of a whole new sequence being shot. That turned out not to be the case. Here's what Gareth Edwards had to say about how this pivotal sequence came to be, and how it compared to the original script. "He arrives and obliterates the Calamari ship, and then the blockade runner gets out just in time and he pursues the blockade runner. And then Jabez was like, 'I think we need to get Darth on that ship,' and I thought, yeah, that's a brilliant idea and would love to do it, but there's no way they're going to let us do it. It's a big number and we had, what, like three or four months before release. Kathy [Kennedy] came in and Jabez thought, f**k it, and pitched her this idea, and she loved it. Suddenly within a week or two, we were at Pinewood shooting that scene. Because it was my last chance to do Star Wars, and because you know it's the end, we really were very careful with it. We storyboarded absolutely everything and tried to have no regrets." One of the many Easter Eggs fans will get to explore more thoroughly when the Blu-ray comes out is the cameo from Gareth Edwards himself. The director plays the character who runs up and pulls the lever that disconnects Tantive IV from Admiral Raddus' ship. That scene is connected directly to the Darth Vader lightsaber battle scene, with the filmmaker adding another fun bit of trivia about one of the other actors who had a minor role in the scene. Here's what he had to say below. "That sequence was shot five months earlier, so we had to connect Darth Vader's moment to that. And another fun fact is the guy who says 'launch.' That actor's name is Christopher Nolan. So whenever someone said Christopher Nolan was on set, it was that guy, but everyone thought it was the director. We had a lot of fun with that." A few months ago, one of the film's other editors, John Gilroy, the younger brother of Rogue One writer Tony Gilroy, confirmed that the Darth Vader scene was in fact added much later, calling it, "a fantastic add." While the moment certainly seemed to resonate with fans, Gareth Edwards didn't think it would be too big of a deal. Here's what he had to say about the scene, which he dubbed "The Walk of Death," while teasing some of the ideas that the stunt team came up with. "It's funny, if you would've asked me what are the top five scenes in this film that people will talk to you about when it's over, I might not put Darth Vader's scene in there. It just felt right; it felt like the right thing to do. It really is just the greatest hits of Darth; that corridor. And we really didn't want to do anything you haven't seen him do so it didn't throw people off. We kept it to what had been established. (The stunt guys) came up with a whole shopping list of ideas. Seventy percent we used, and maybe thirty percent felt a little too extreme. They were things you hadn't seen him do before, and I wanted to stick to what Darth does in the original trilogy." While it's impossible to know how fans would have reacted to Rogue One: A Star Wars Story without this scene intact, it certainly didn't hinder the spin-off's success. Rogue One opened huge with $155 million in its opening weekend back in December, en route to a $530.1 million domestic gross, which made it the top-grossing domestic movie of 2016, and $1.05 billion, which fell just short of Captain America: Civil War's global tally of $1.1 billion. Disney and LucasFilm are currently in production on the next Star Wars spin-off, Han Solo: A Star Wars Story, which is set for release on May 25, 2018.